​If the word ‘utopia’ masks false optimism, what is the endgame of civilisation? Exponential and disordered expansion of populations, economies and cities, would lead to its opposite. The translation of ‘utopia’ from the ancient Greek, as ‘no place’, certainly conjures a sense of the unrealisable. Therefore, is it a question of acceptance, where to be enlightened is to accept reality without judgement? In a world of magnifying complexity, fragmentation and unpredictability, it is tempting to look to the past for insight or wisdom. Yet civilisation finds itself at an unprecedented point. Imagination, as the quality that separates the human race from its primordial origins, has repeatedly paved the evolutionary way. 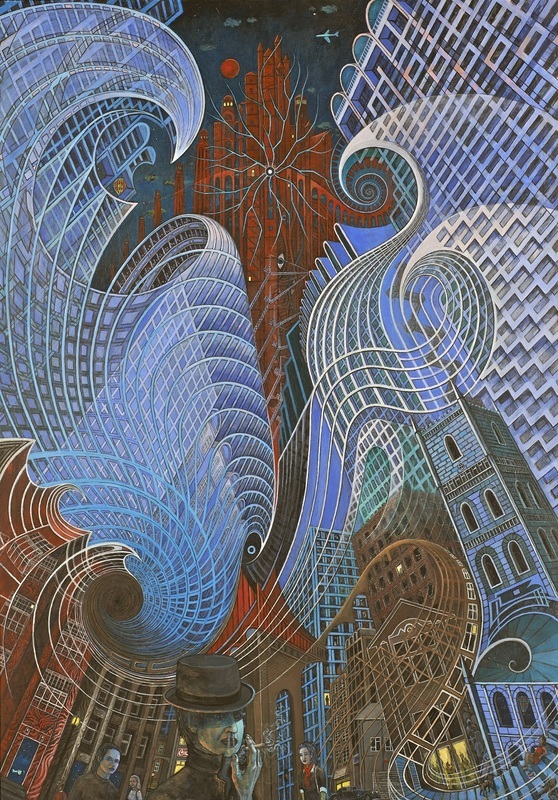 The field of painting, faced with a blank canvas and an unfathomable flow of imagination, allows for enormous freedom in the collaboration of visual philosophy with mathematical precision. 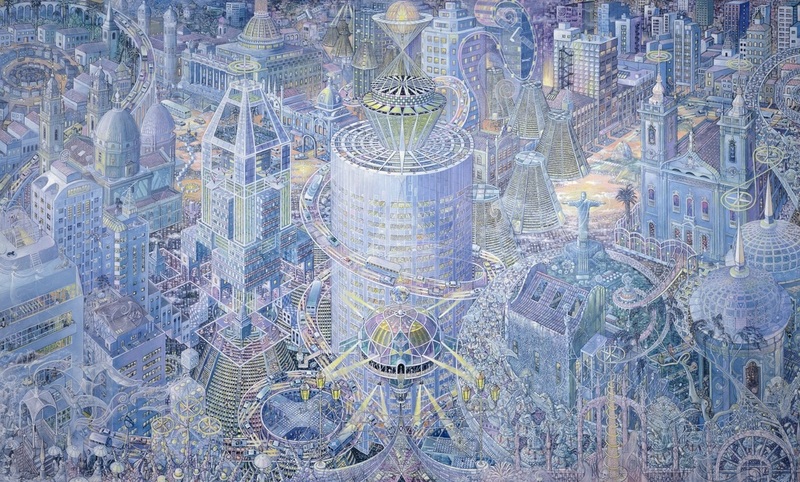 ​Metropolis combines aspects of the Rio de Janeiro skyline with imaginary buildings and structures to form a kaleidoscopic, interconnected city, floating high above the Guanabara Bay, as though suspended in collective dream. The observation balloon invites the viewer to cross the hanging bridge, to look inwards to the cosmos and outwards to the elevated city that is alive with balanced asymmetrical movement, internal orbits, multiple focal points and light. 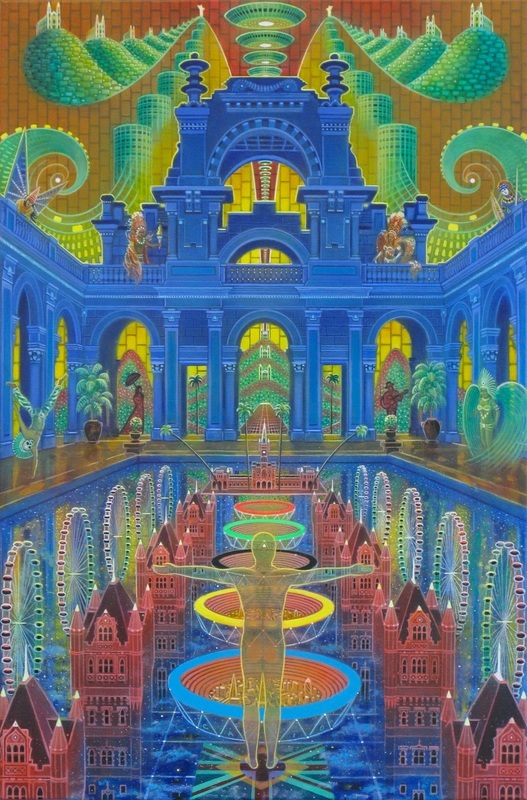 The complexity is contained within an overriding integrity and flow, alongside which nature, represented by the relaxing Jaguar and nearby perching parrots to the right, can peacefully co-exist. Confluence connects Rio to London, alluding to the Thames and the title that was given to Rio de Janeiro under the mistaken belief that its geographical features formed a river estuary. The pool of Parque Lage is the meeting point, where towers in London’s recognisable neo-gothic Victorian style echo towards, and are welcomed by Isla Fiscale, a strangely reminiscent feature of the Bay of Rio. Beyond and above, a symbolic Rio, with rolling hillsides, Sugar Loaf, Christ the Redeemer, downtown buildings, viaducts, cathedrals and colonial churches, form a central valley, emanating through which is a vision of the future embodied in Niemeyer’s museum in Niteroi. 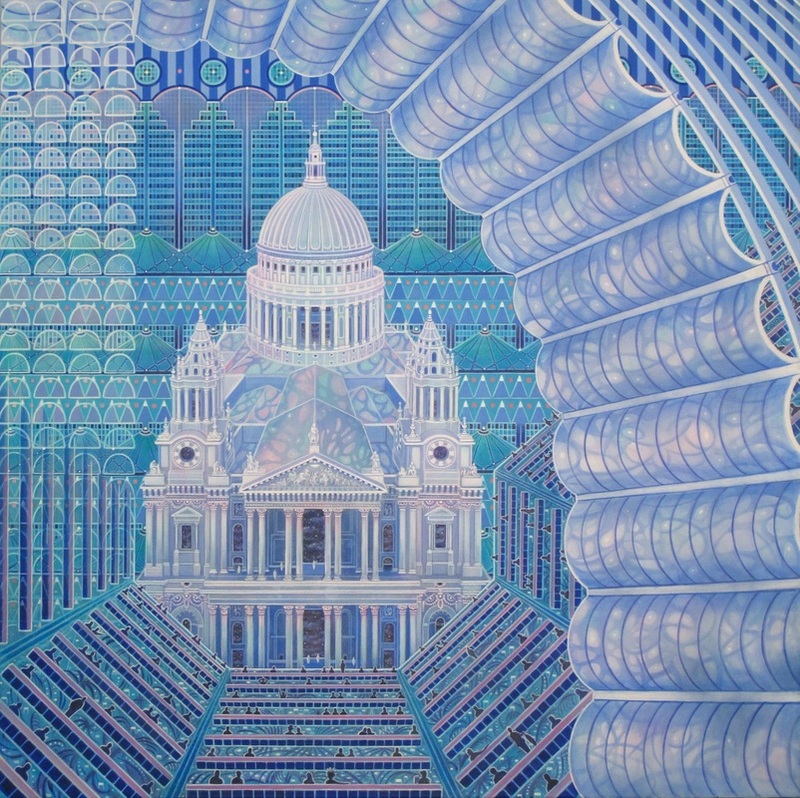 ​From the introspective vision of Citadel, the London series of nine paintings evokes the past and the changing face of the city, represented as a somehow more ethereal, abstracted and mutable prospect. Layered structures and shapes are questioned within the march of western civilisation. Geode Lens rediscovers the angular aspects of the urban environment by analogy to the crystalline interior of a hollow rock structure, as though unearthed from a geology conceived in the mind of man. Beholder creates confusion as to the sense of ownership when the city survives the generations of inhabitants that sustain its existence. Cloud Nine again shifts the view between the observer and the observed and contrasts neo-classical baroque with the retrospectively utopian architecture exemplified by the Barbican centre. Caio Locke is an Anglo-Brazilian artist who was a qualified lawyer before changing careers to focus on painting. 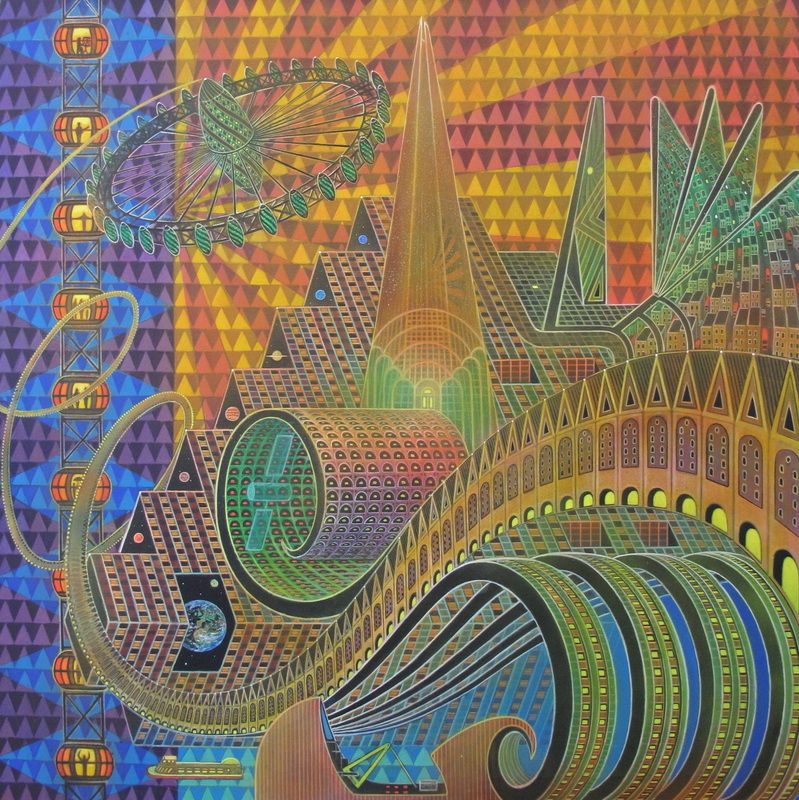 His process relies upon imagination and experience, while combining mathematical precision with abstract thought. Within this he expresses his subjective response to a dialogue between the interior and external worlds. 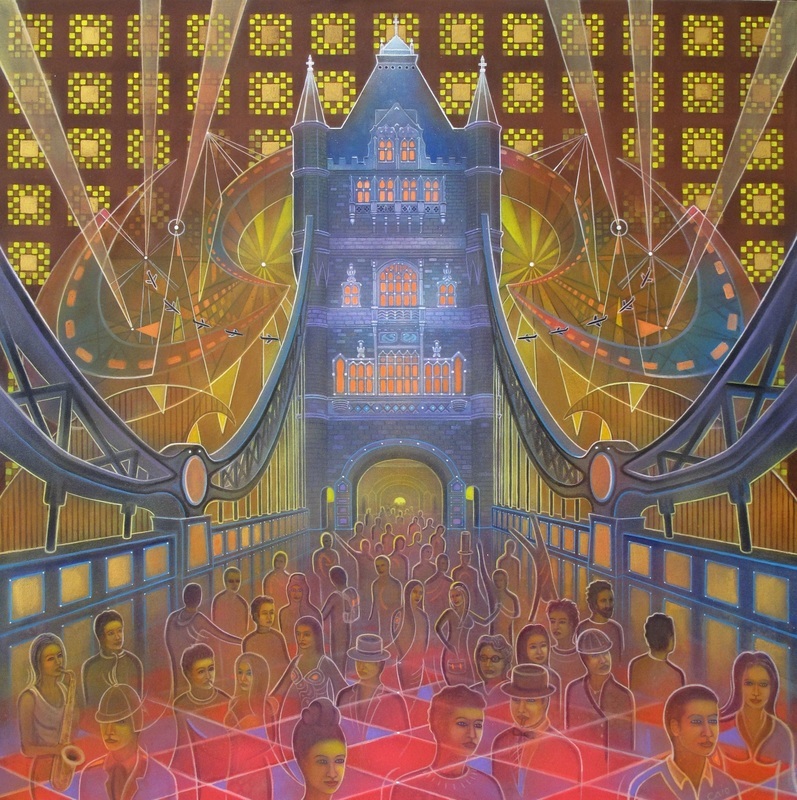 The results are compelling mindscapes which also explore the notion of the city as a physical manifestation of collective human nature and consciousness.